The arm for my Bravo / Bravo II / Bravo Pro is stuck in the up or down position. It makes a buzzing noise when I power on the unit. This can happen if the Bravo II power is interrupted during an arm movement. Use the following procedure to correct the problem. 1. Power off the unit. 4. Move the arm to the far left to get a better view. 5. Turn the screw drive up or down with your finger depending on whether the arm is stuck in the up or down position. Turn the screw until the arm has been moved approximately one inch. 6. Power the unit back on. The arm should move to the correct position and begin to act normally. 7. If the unit still does not begin to function, clean away any grease that may be in the home sensor shown in the diagram above. 4. Move the arm to the far right to get a better view. 5. 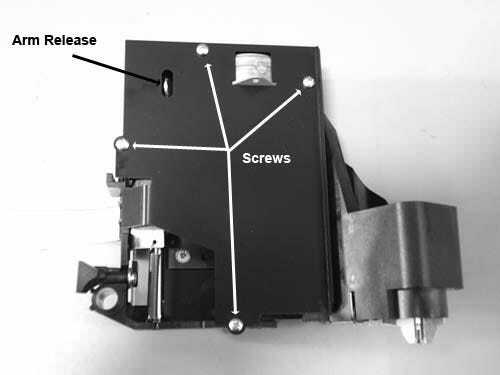 Turn the screw drive up or down with your finger depending on whether the arm is stuck in the up or down position. Turn the screw until you can access the home sensor shown below. 6. Clean away any grease that may be in the home sensor shown below (step 2). 7. 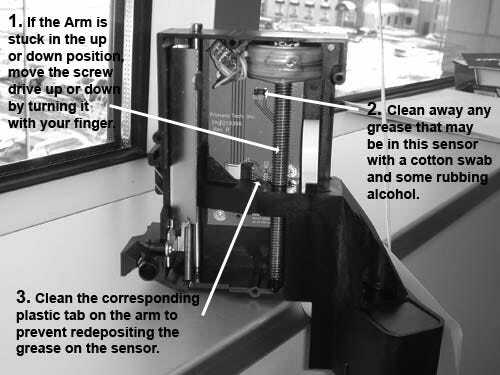 Also clean away any grease that may be on the corresponding tab on the arm (step 3).